SteriPocket® is 2 8-ply, pre-packaged, pre-sterilized, rayon/polyester nonwoven sponges. SteriPocket® sponges are intended to be utilized and dispensed following an extraction or surgical procedure. The packaging is paper with a clear wrapper backing; patient instructions are printed on the paper side. The box contains 4 trays convenient for dispensing out of the operatory. There are 200 SteriPocket® in a box of 2×2 and 100 SteriPocket® in a box of 4×4. SteriPocket® rayon/poly 2×2 nonwoven sponge was evaluated by 29 consultants in over 1200 uses. 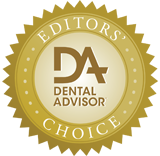 This nonwoven sponge received a 96% clinical rating. The individual packaging of SteriPocket provides a convenient and professional packet for dispensing to patients after surgical procedures. The non-woven gauze are highly absorbent and do not create lint. Each sponge is thick and effective in covering a surgical site without adhering to the wound. 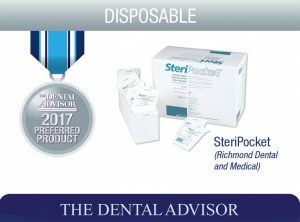 SteriPocket also saves time for dental assistants who would otherwise have to pack and sterilize gauze. Patient instructions printed on the package are a good reinforcement of the dentist’s instructions.